These tombs date from the 15th century and show William Canning and his wife on the upper sketch, with dogs and foliage under their feet. 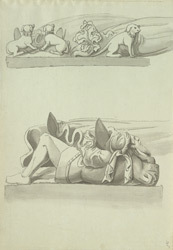 The lower sketch shows a jewish merchant under Canning's feet. Canning was a very wealthy, local shipbuilder during the reign of Edward IV, and a most generous patron of the church. He was Mayor of Bristol five times.